With Readly you can read Sporting Rifle Presents and thousands of other magazines on your tablet and smartphone. Get access to all with just one subscription. New releases and back issues – all included. If you’re dedicated to controlling foxes on your ground, you need this all-new guide to foxing – the experts’ way. Legends of the modern foxing profession including Robert Bucknell, Mike Powell, Gary Green, Mark Ripley and more all contribute their guidance, with in-depth guides to kit selection, seasonal tactics, foxing fieldcraft and more. Splitting this collection’s content into themed sections, we first cover lamping out in the fields, before turning to modern solutions with night vision and the TI revolution. Then we deal with how to do it – ambush from a high seat, calling, waiting and more. Finally, we consider some of the more extreme foxing strategies out there, from the first ever thermal riflescopes to new calibres and fox shooting at 600 yards. 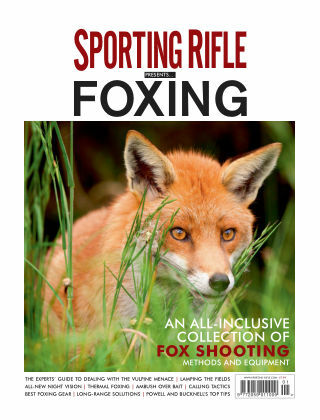 Edited by Sporting Rifle’s editor-in-chief and prolific sporting author Peter Carr, Sporting Rifle presents Foxing is set to become the definitive guide to modern-day foxing – the only fox-shooting collection that combines the very latest kit with traditional know-how. Read up and turn the tide in your favour in the never-ending battle against the vulpine menace.